No matter where you work out, this sleek yet durable canvas bag is a classic. 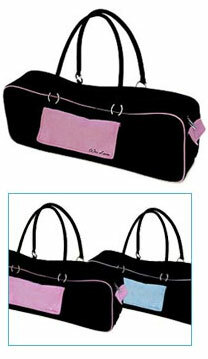 Features include a fully lined and padded interior, two-way zipper, and convenient exterior pockets. Roomy enough for a yoga or Pilates mat plus a towel and other accessories, this versatile bag is a practical fashion essential! Now available in Black/Pink or Black/Blue.